Houdini was a ‘surprise’ that I received when I was 10. I had ridden him in lessons and the intention was for me to lease him, but my parents actually purchased him and didn’t tell me about it until after! Houdini is a 1996 Spanish Mustang gelding, he’s just under 14.2hh and a bay roan, and I have to say, we got pretty lucky with him. He and I really learned the ropes of eventing together, starting at Beginner Novice (before there were Goldilocks or Green as Grass) and working our way up to Training level. Houdini comes from a managed herd of Spanish Mustangs that is located in Oklahoma. There is a roundup from this herd each year in order to control the population, and the year that Houdini was part of the roundup, he was purchased by an equine veterinarian named Dr. Sherm Mathey. Dr. Mathey kept Houdini for several years, broke him under saddle, then sent him to my trainer, Diane Hanrahan. Houdini was part of the lesson program at South Star Stables for a while, which is where I met him. We did our first cross country schooling on a bit of a whim and very soon after made the jump from local schooling shows to recognized events. We were not immediately successful. Houdini is many things, but submissive he is not, and I soon learned that dressage was not his favorite activity. He would drag me around any cross country course I put him on (literally drag me around, I was ten and weighed maybe 60 pounds), but he fought every step in the dressage arena. We did dressage schooling shows, tried every bit we could get our hands on and any tricks we could find to try to soften him, but he never became a dressage prodigy. We have both made great improvements over the last 16 years, myself as a rider and him in terms of softness and submission, but I’ve come to accept that he is simply not a classical dressage mount. Remember how I said that dressage was not his favorite activity? It turned out, jumping is! He is quite athletic and could be bold on cross country and careful in stadium, which sometimes made up for our shortcomings in the dressage phase. We got the hang of the whole eventing thing eventually and after 3 years of competing at Beginner Novice, we finally determined that we were ready to move up to Novice. We continued to grow our partnership and moved up to Training level in 2007. We got seasoned at the level and were pretty successful until Houdini suffered a bowed tendon in 2010. We spent a long time rehabbing and brought him back very slowly and, fortunately, he has been able to continue eventing at the lower levels. He is semi-retired at this point but he really does love being in work and getting to go on field trips, so when my schedule allows, I try to give him as much time out as I can. His most recent competition was in April 2017 after a very long four year stretch without competing, and he didn’t miss a beat! He was foot perfect the entire weekend, and though it was only Beginner Novice, he was so happy to be back at it that I may just have to take another spin on him this season. Apple was the beginning of the end. My love of horses as a small child was already a rampant obsession my parents couldn’t control. Literally a tiny toddler in a horse printed dress, pretending to be a horse, playing solely with pony toys, and dying for my weekly riding lesson. There were no long term plans to buy a pony or a horsey (I think my parents hoped I would outgrow the “phase”), but I was loving learning everything I could about horses. 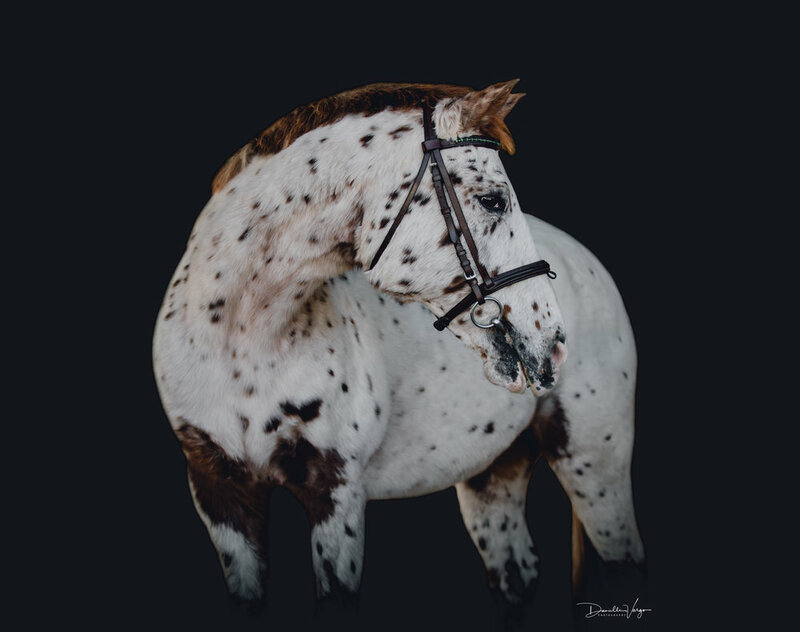 Enter one 13.3, overly sensitive chestnut leopard appaloosa pony with an attitude problem. My childhood trainer bought him as a green broke 6yo for her lesson program. At that age with all his sass, he certainly wasn’t suited for it! The first time we met was only a couple days after him settling in to his new surroundings. I was only 6 as well and was immediately smitten by his spots, having just been learning about the Nez Perce tribes and their appaloosas. He softly whickered at me, which quickly became my favorite sound and still is to this day. I was amazed that I, of all people, got to ride him for my lesson! I felt special, with nervous butterflied. That probably didn’t help him. He was a bit wide eyed and unpredictable, meaning the first time I tried to canter, I ended up bucked off, sprawled in the sand, UNDERNEATH this pony’s belly. What struck me was how Apple looked between his legs at my crumpled little body and tip-toed as not to step on me. He nudged me as if to say he was sorry and I laughed. Our friendship of (now) 17 years started there. He began as a lease pony that eventually, for Christmas, he showed up in my front yard. Best Christmas present ever, from the best parents ever! From their perspective, it must’ve been hard, watching their child hit the dirt so many times from such a complicated pony and fight frustrated tears at shows after not placing, but I can’t help but love them more for understanding I didn’t want the easy way out. His challenges shaped me into the rider I am. 16 years later, he’s earned his retirement, and I’m hoping to make this next chapter of his life as lush and enjoyable as he so readily deserves. He was certainly unique in his youth as a serious bucking bronc prospect and became well known for dumping anyone and everyone whenever HE wanted. Cleared by vets, chiropractors, saddle fitters, etc., I just conceded it was part of his personality! That sassy personality is one that can never be duplicated. He is kind beyond compare, tolerant, understanding, and so tolerant. When we were young together, he mirrored my social anxiety as a bit of an anxious introvert, but helped me come outside of my shell and we both grew into ourselves and our place in the world. He was born with a servant’s heart, exceptionally intuitive to the needs of those around him, and has proven it by teaching confidence to countless children in the early stages of being horse crazy. His gentleness led to a two-year stint as a therapeutic riding horse, helping those with physical and mental handicaps feel the freedom and trust that is riding. He has a remarkable ability to understand rider’s strengths and weaknesses and test them. Even as a competent adult dressage rider, he continued to teach me lessons in softness, sensitivity, and how every step matters in training. He always knew if I was feeling a little too confident and would give me a good taste of humility – pony style. Especially when it came to kids and his therapy riders, he always seemed to understand just how far he could push their strength without scaring them and was always the first to reward something done correctly or slam on his brakes if he felt them losing their balance. He never wanted to hurt anyone. While all goodness and light 95% of the time, his sass knows no bounds the other 5%! He’s smart as a whip and knows how to un-clip himself in cross ties, untie himself, slip out of halters, turn off electric fences, open doors, gates and containers. One time I found him in the barn (his pasture was 2 acres away!) and he had opened a box of rainbow nerds and was flinging it around in his teeth to shake them out, covering me in rainbow foam in the process! This is the alter ego my dad affectionally nicknamed “Crapple”. Apple is semi-retired. Back in his day he did some lower level dressage, and he hated it. He seemed to think that the white railing around the dressage arena, was just in his way of jumping. I cannot count the amount of times we were eliminated from schooling shows because he would take control and jump out, back in, then back out, all for fun. Dressage was a struggle for his mind and anxiety, but that didn’t keep him from competing in the Pony Championships, where he helped our pony team place bronze! After that we quickly moved to show jumping. His talent for jumping was pretty incredible. We used to have to enter a throw away cross rail/18″ class every show due to the aforementioned penchant for bucking. No matter what, I would always find myself with a mouthful of sand that first class, accept our elimination, then go on to place well (but usually win!) in our next classes. He was notoriously dishonest when schooling cross country, always a little questionable about why the jumps didn’t fall down if he hit them, so we stuck to show jumping. Once he became a lesson pony, he returned to the dressage ring with minimal jumping, and helped a couple young girls learn the ins and outs of intro/training level. Due to some stifle issues, we began doing lots of work in hand and managed to strengthen him enough for adorable (and correct!) pony piaffe/passage! He is pretty fun to ride with no tack at all, and gave me a true understanding of an independent seat. Apple’s true worth comes from not only his long resume of fantastic things, but comes from the fact he weaned Joy when she was 7 months old. After he weaned her, they developed a deep and lasting relationship that still confuses me. Anyone who can put up with Joy for 7 years (he weaned Joy in November of 2009) deserves all the treats and life of luxury possible. Oddly, 1997 as a 3-year-old, he was caught in a barn flood that killed all but two of the horses. The story is that the trainers/riders were away at a show and the water rose too quickly for the barn hands to get to the rest of the horses. Originally bought as a fancy hunter prospect, he and one other pony were small enough to swim through their stall windows and were found on a nearby hill when the flood waters receded. Because of this, we don’t know much about his past. Technically, he’s considered Grade because he does not have papers, but I’ve been in contact with the Pony of the Americas Association and are working to get him DNA tested to see if I can discover his true identity. There’s no way a pony this adorable and with such cute movement was a breeding accident. If you have any ideas or information, please contact me! I could use anyone’s help. I always say Joy takes me places I’ve never been, but Apple is responsible for every great adventure. His last great adventure will be weaning Joy’s foal, likely November of this year. I only hope to let him live out the rest of his years in complete spoiled retired fashion. He was far from the “perfect” first kid pony, but I wouldn’t change a second of it for more blue ribbons or less humiliating falls. I owe everything about the rider I am today to him.